How Younger Catholics Understand Their Catholicity & What It Means for the Catholic Institutions and Communities in the Future. Louise Akers, SC, has a wide, gracious smile for most everyone she meets, but she is no pushover. Over the past six months Catholics from thirteen dioceses across the U.S. and four dioceses in England have downloaded the free Save Our Parish Community resources from the FutureChurch website. Speaker and award-winning author known for his work in Church reform died on August 5, 2017. 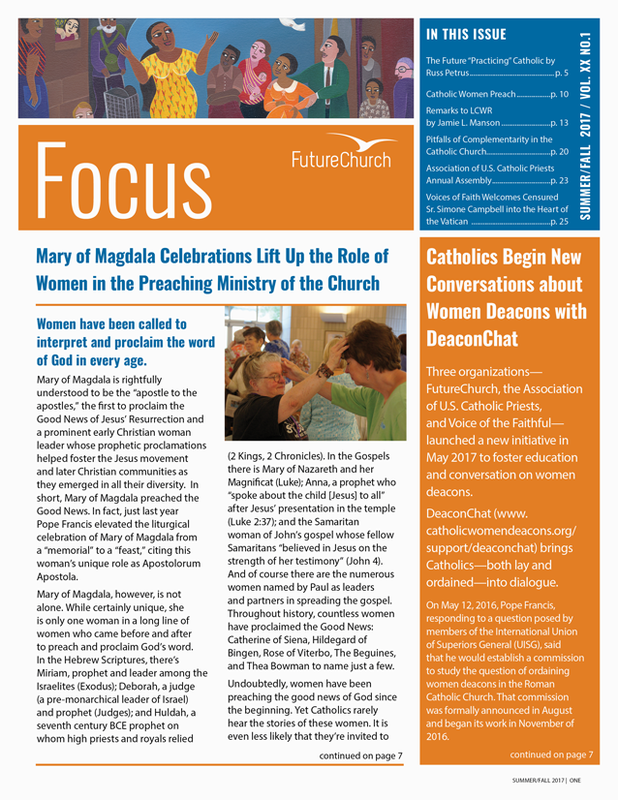 AnalysisJustice in the ChurchDoes a papal decree matter for the inclusion of women? Yes! Pope Francis issued a new decree stating that women should be included in foot washing rites held on Holy Thursday. Father Charles Curran and Archbishop Paul-Andre Durocher addressed FutureChurch supporters at 26th Annual Fall Event.